Sample of the Original Printed Edition. 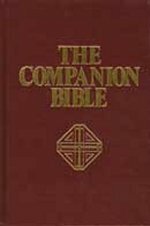 The Companion Bible Condensed HOME PAGE. An in-depth study Bible for those who seek to know and understand God’s word in the trusted and familiar language of the King James Text. Extensive marginal notes with appropriate Hebrew and Greek analysis provide alternate translations of critical passages and call attention to other relevant texts. Detailed outlines focus on the context and significance of each book while emphasizing how each part fits into the whole. Helps include: 198 appendixes of Hebrew and Greek words and their use, including Figures of Speech, charts, parallel passages, maps, lists of proper names, calendars, and timelines., keyed to the marginal notes, provide additional information on genealogies, synonyms, historical and a wide range of other important topics, A “Must” for the Serious Bible Student. See Introduction for this site. Make a donation to keep us alive and Thank You for downloading PDFs of The Companion Bible (Condensed).